The book has usefully been divided an sub-divided under many headings which tell a story of faith and faithful. The subject matter very from birth unto death and fall into the preview of moral, social, religious and political aspects which confront us every day. It is a portrayal of good and evil in the eyes of God and at the same time if is an embodiment of Advices we may accept in righteousness and piety. The history of Islam since the nineteenth century is a history of revival and efforts at re-adjustment under the double stimulus of challenge from within and without. Slowly at first, and not without set back, but with Increased momentum, the Muslim community bas gathered itself together and begun to look to its defences, re-awakened and alert, and is searching for the "Light" with which to advance united into a glorious future predicted so often in the Quran. The Quran is the record of those formal utterances and discourses which Prophet Mohammad (be peace on him) and his followers aceepted as directly inspired Muslim orthodoxy, therefore, regards them as the literal Word of God mediated through the Angel Gibrael. The Prophet. 's own behalf which is still held without question by his followers was that these discourses were portion of a "Heavenly Book", sent down to or upon him in an Arabic version not as a wohle but in sections of manageable length and in relation to the circumstances of the moment with the result that the Quran as a whole is a reply to all our queries, worries and miseries. From the Quran itself it is clear that the existence of a Supreme God, Allah, is assumed as an axiom common to Prophet Mohammad (be peace on him) and his opponents. The Quran never argues the point; what it does argue is that He is the one and only God-La Ilaha-Illallah, there is no God but Allah and that God is the Omnipotent Master and the man is His creature who is ever in danger of Incurring His wrath if he disobeys the Law. This is the basis of all Muslim theology and ethic. Forgiveness is only to be attained by the Grace of God; man can win it for himself by merit and to be worthy to attain it requires of man unrelenting self-control and the services of God by means of good deeds. God is the Light of the Heavens and the Earth. The similitude of His Light is as It were a niche wherein is a lamp, the lamp within a glass, the glass as though it were a pearly star. It is lit; Light upon Light, God Guideth with His Light whom He will and that eternal Light Is shown to every man and woman who agrees to a. religious practice or rule of faith as revealed through the means of Quran delivered and Inspired by God and preserved from error. The whole spirit of Islam is to revive finally the human faith In monotheism and the ethical standards to the levels set by the preaching of earlier Prophets as laid down In the "Heavenly Books" they brought unto men and women. As a dynamic system and safe anchor for humanity Islam embodies eternal virtues necessary for the Individual and the community. Its unique distinction and greatness lies In its emphasis on practice. The teachings of Islam enunciated in the Holy Quran are undogmatic, flexible and adapte.ble to all ages. The Quran Is not a testament for believers. It is a book of heavenly wisdom open for everyone whose soul burns with the passion of turning the virtue In abstract into the virtue in practice. 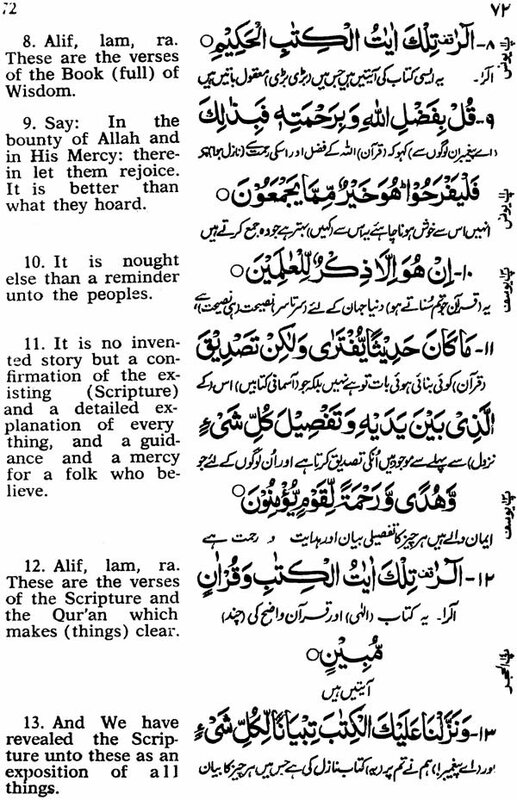 In the present day atmosphere or hostility, "suspense, and discontentment when the soul of man Is wandering In bewilderment, Islam is the only refuge offering spiritual elevation and peace of mind without belittling material progress and man's control on nature; and the Quran Is the guide to the destination of heavenly bliss which no great man of today predicteth.